1 I am a Son of God. And can I be another thing as well? Did God create the mortal and corruptible? What use has God's beloved Son for what must die? And yet a neutral thing does not see death, for thoughts of fear are not invested there, nor is a mockery of love bestowed upon it. Its neutrality protects it while it has a use. And afterwards, without a purpose, it is laid aside. It is not sick or old or hurt. It is but functionless, unneeded and cast off. Let me not see it more than this today—of service for a while and fit to serve, to keep its usefulness while it can serve, and then to be replaced for greater good. 2 My body, Father, cannot be Your Son. And what is not created cannot be sinful or sinless, neither good nor bad. Let me, then, use this dream to help Your plan that we awaken from all dreams we made. Most of us have a relationship with our body of either loving it or hating it or loving and hating parts of it. Yet Jesus says that the body is neither good nor bad. (W.294.2.2) In fact, it is just an instrument---a communication device---and like everything else in our world, it can be put to a useful purpose. What is it for? What use might we put it to? Will it be given to the ego for its use or used for a holy purpose by the Holy Spirit? The important thing is to come to the recognition that the body is not what we are. It was not created by God, "And what is not created cannot be sinful nor sinless; neither good nor bad." (W.294.2.2) It is simply a useful tool for a while. We are, however, urged to "use this dream [the body] to help Your plan [the plan of the Holy Spirit] that we awaken from all dreams we made." (W.294.2.3) The body is useful as a vehicle to extend the message of love to our brothers and sisters. When in the service of the Holy Spirit, the body becomes a means and not an end in itself. It is also a useful indicator as a witness to what is in the mind as it can inform us in ways that our thinking mind cannot. As such, it is not helpful to deny what we are seeing or what we are feeling. Without this witness, we would not see what is in our minds to be forgiven. As we commit to forgiveness, we increasingly recognize that our reality is a mind and with it, our identification with the body is loosened. When our main focus is the body, we remain vigilant of its care and protection, and we fear what can go wrong with it. When we mistakenly think that the body is what we are, we become very concerned about its well-being. This is not to say we should not pay attention to taking care of the body, as to do our function requires that we keep it serviceable. We can take care of the body and still keep God in the forefront of our minds. For me, being in the shower, for example, is a wonderful place to allow the mind to be washed of any concerns and to set the direction for the day. It is not important what the body is doing, but it is important where the mind is in the doing. There are several passages in the Course that speak of our hatred for the body when it is not used as a tool for purposes of awakening. We are right to question why a loving Father would create that which is corruptible and has a short lifespan with intervening years of suffering and pain. This is simply not consistent with Who our Father is. If He has the power to create only what is perfect, why would His power not be used for only that? To create such corruptibility, as bodies in a decaying, destructible world, cannot be conceived as coming from a loving Creator. 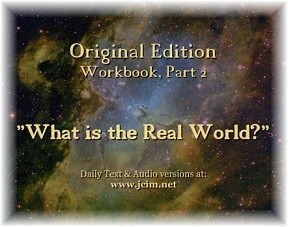 Thus, it is not possible that God could be the source of our bodies and this world. The image of a god made by the ego is the source of all this. He tells us not to fear temptation but to see it as an opportunity to choose again. In every difficulty, Christ calls to us to make this choice. It is just another chance to remember who we are. When we make this choice, the Holy Spirit does all the heavy lifting for us. Trying to do anything on our own to change ourselves is not helpful. In fact, it is just an intrusion on His role. Let His strength prevail. Let His Will be done. It is interesting that Helen Schucman and Bill Thetford, who brought the Course into the world, both left their bodies not long after the Course was published. Helen wrote down the Course starting in 1965 and finished it in 1972. She died in 1981, while Bill continued on with the teaching and then left his body in 1988. Helen was 72 and Bill 65 at the time of their deaths. It seems that when our function is completed here on earth, there is no reason to continue on. Of course, we don't know the state of their minds at death, but the day before he died, Bill Thetford said that he felt his function was finished and that he had forgiven everyone. The next day he left his body. While the body is not made by love, it can be lovingly used as an instrument for healing. It is not to be denied while we still believe in its reality. It is still a useful witness to our state of mind. The people that trigger us are the gifts that help us return to the holy Self we are.